Strictly speaking the Pennsylvania cannot be considered a Caithness wreck as she struck and sank off the island of Swona, which is one of the many Orkney Islands. She has however been included her here as Caithness people were heavily involved in the aftermath of her wrecking and especially in the subsequent salvage and sale of her goods. This Copenhagen registered steamer stranded in thick fog on the North-west side of Swona, shortly after sailing from New York with a general cargo. The ship had encountered thick weather which had lasted all the way across the Atlantic and the captain had been on the bridge of his ship for nearly ninety-three consecutive hours prior to the stranding. 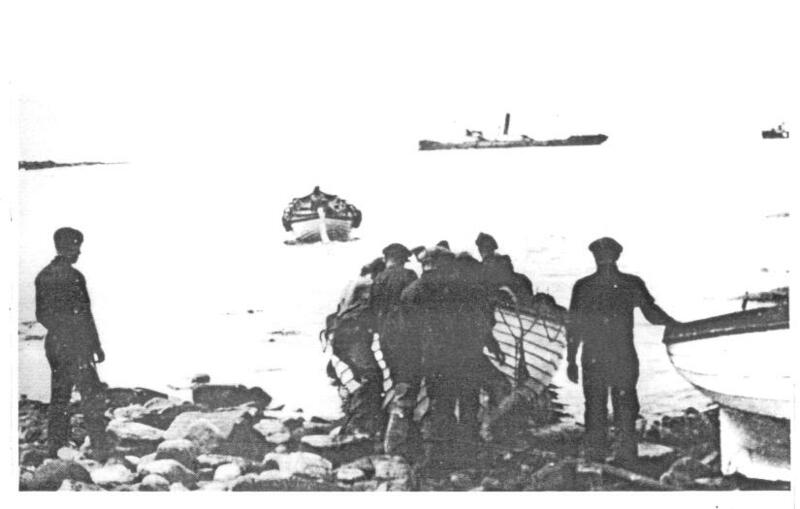 After refusing asistance from the Longhope lifeboat which stood by the casualty, the crew of thirty-three landed on Swona the next day in their own boats. Within a week the ship's back had broken and efforts were then concentrated on salvaging the cargo by a Danish tug called Garn. With no hope of salvaging the ship the Danes abandoned her. The insurance underwriters wrote her off and she was sold for only £100 to a group of local people who formed a consortium for the purpose, (The Receiver of Wreck received the £100; 50 shares at £2 per share). The Pennsylvania's cargo included an amazing array of goods, office equipment, clothing, motorbikes, footwear, food, flour, ladies-wear, watches, apples, motor cars and a truck, tyres, tools, galvanised pipes, sheets and cigarettes. Later, after about three weeks when the vessel had broken up completely, a substantial amount of the cargo turned up in Caithness and Orkney although how typewriters managed to float or American cigarettes reach shore bone-dry no doubt exercised the minds of the local customs and Excise officers. Old habits died hard and the Orcadian carried a lengthy article on the activities of the 'pirates'. An Essex motor car was owned by a Caithness man after he purchased it for a nominal sum, having been removed from the Pennsylvania. A report says that the vehicles and motor cycles were mainly packed into boxes and being aware of the numbers for a complete set of boxes ensured a complete vehicle. George 'Dodie' Gunn, a fisherman out of John O'Groats, paid two visits to the wreck, that being all that was needed to pay for a new engine that he had installed in his Stroma yole, Hope. John D. Sinclair late of Redgeo, Stroma, purchased 10,000 spark plugs out of her cargo for 3d (1p) each while home on holiday from Glasgow where he was a successful businessman. They were loaded into his Morris 8, inside, on the roof, along the running board and on the rear platform. The car was so loaded that it could not get up the south Berriedale Brae in first gear, so he drove it up in reverse!. It was all worthwhile however for he sold the plugs in Glasgow for three times their cost at 9d each. The names of the shareholders were: D.Robertson, Wm.A.Bremner, Wm.Simpson, John Robertson, James Robertson, David Sinclair, Andrew Manson, Sinclair Manson, John Sinclair, James Robertson, George Wares, John Simpson, George Simpson, Eben Dundas, David Simpson, Donald Manson and James Simpson - Stroma. David Gunn, John Banks, John Dunnet, Andrew Dunnet and William Cormack - John O'Groats. Jimmy Rosie Snr, Jimmy Rosie Jnr and Arthur Rosie - Swona. The Pennsylvania was built of steel in 1907. She was 108m long by 15m wide and was 3759 gross registered tons. More stories of the salvaging of goods from the Pennsylvania can be found in an excellent booklet written by Wick Historian Iain Sutherland in 2011, titled; The Loss of the Pennsylvania. A report by Undermarine Operations Ltd. from 1971 states: The wreck is reported at 58 44 52N, 003 03 35W on the west side of Swona Island, just below and to the west of a rock pinnacle which is awash at low water. From the pinnacle to the wreck is a drop of 12 metres. The seabed then slopes steeply to 27.4 metres. The stern, prop shaft, engines and keel lie at base of pinnacle and there are parts scattered down the slope westward. There is little of the wreck left and the greater part is covered with thick sea whip.